The Children’s and Youth Choir of Pécel was formed at Christmas 2003, inspired by the launch of a new project in the town’s cultural life, namely the annual Christmas concerts. It was on this occasion that conductor Zsuzsanna Szilágyiné Szalai recruited a group of 20-25 talented children. In a few years this group, operating only seasonally at first, grew into a choir with regular rehearsals, 6-8 performances a year, a growing headcount and developing quality. A distinctive feature of the Children’s and Youth Choir of Pécel has been incorporating members of a wide range of ages, which is mainly due to the fact that its core is made up of a few music-loving, enthusiastic families. As a result, young children (sometimes from kindergarten) and teenagers are joined by their parents for singing together, and besides the children’s and youth choirs, the Mixed Choir also regularly performs at different events. In 2014, fulfilling demand coming from teenage members, yet another group was founded, the so-called ‘Rutafa’ Choir, named after the first serious piece they sang (the folk song Magos a rutafa). The Rutafa Choir has 35 members, boys and girls, including several children with soloist skills, which makes high-level performance of solo and chorus pieces possible. 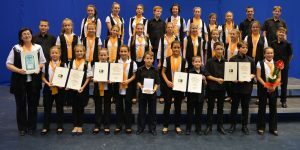 The Rutafa Choir was selected into the prestigious 12th Cantemus International Choral Festival (Nyíregyháza, Hungary) and received a Silver Diploma from its international jury. The repertoire of the Children’s and Youth Choir of Pécel includes medieval, renaissance and other styles, with an emphasis on choral works and folk song arrangements by Zoltán Kodály, Béla Bartók, Lajos Bárdos and József Karai. In addition, they perform the songs and folk song arrangements of other nations, gospel arrangements, and choral pieces written by their conductor, Zsuzsanna Szilágyiné Szalai. The Children’s and Youth Choir regularly performs at cultural and church music events in Pécel. In 2015 they participated in the public educational program of KÓTA and the Hungarian National Gallery. They are active performers at the events of the Lajos Bárdos Musical Weeks, and have been going on concert tours in Transylvania since 2009. The choir has already performed in the Basilica of Nagyvárad (Oradea), in Nagyszalonta (Salonta), Kolozsvár (Cluj-Napoca), Székelyudvarhely (Odorheiu Secuiesc), Zsobok (Jebucu), Tenke (Tinca), Tordaszentlászló (Savadisla), and in Szentegyházasfalu (Vlahita), where their host was Sándor Haáz, founder and conductor of the children’s orchestra ‘Gyermekfilharmónia’. The choir gave a concert in Mistelbach, Austria in spring 2017 and in Iisalmi, Finland in November 2017. The choir regularly performs at galas and corporate events where atmosphere is enhanced through quality music. The repertoire features songs in the English or French languages, as well as Hungarian and Latin pieces. 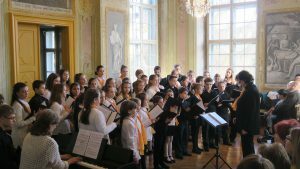 In April 2016 Zenével a Gyermekekért Kulturális és Hagyományőrző Egyesület (With Music for Children Association for Culture and Tradition) was founded, securing a formal framework for the operation of the choir. Its goals are: support and development of musical culture and public education; cultivation of folk traditions and folk music; talent care and keeping contact with Hungarians beyond the border. The activities of the association cover, among other things, the operation of the children’s and youth choir and the organization of concerts, music festivals and music camps. The association is headed by Zsuzsanna Szilágyiné Szalai. Address of the association: 2119 Pécel, Petőfi utca 94.